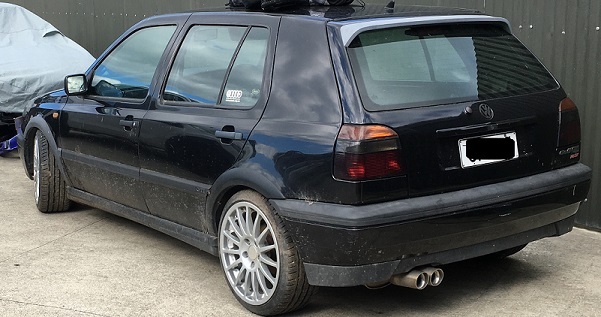 Short story is that I inherited a 1997 Mk3 GTI from a mate, which was not running. It had been sitting for 18months or so. Covered in spiderwebs and mossy bits. Anyhow, replaced fuel pump, new fuel, oil change, battery and she was away. It came with a few mods, Adjustable Suspension, 17inch alloys, messed with Air box. Has a 16v ABF n 5 speed manual. Sat at my place for another 18 months until earlier this year I finialy lifted the covers off it and got started. Removed all the back seat, all door trims, stereo, roof lining, airbags, pass. seat. surplus seatbelts, carpet. Then took it down to my mates workshop for the rest of the tear down. Sounds like the start of a build thread. Have you got any pics of the car? Maybe someone can sort this out? Best thing to do is host your images on a proper image hosting platform and then link them back here. Personally I use imgur, but these days photobucket is also back online and there are many others. Get the URL link to to your image and then enclose it in img tags. Just the Mona Lisa icon when you are composing a message to create your IMG tags. Nice to see Aidan's mk3 back to life! Looking forward to seeing the photos and build! Unfortunatly I did not take photos at the beginning..
but here are the ones to date. I have a small amount of sound deadening left to remove, then Steve (Frost Motorsport) will begin to fabricate the cage. In the mean time I will be on the look out for seats/ harnesses, and other various things thatwill be required for this build. I still have a soft spot for the old MK3. This is my first real step into Euro Land. Had a number Oz and Jap perf. cars. V8, 6 and 4 cyl. Already had some surprises with Vacuum central locking, removalable firewall bulkhead (insead of solid stamped) and almost all removable sound deadening (as apposed to mostly glued in). Mountains of wiring .... Being able to remove spot weilds for all the seat mounts and not having to cut them because they go through the trans tunnel was nice too. (These will be replaced with solid custom seat mounts for the racetech seats that will be installed.